The Ambassadors Theatre (formerly the New Ambassadors Theatre), is a West End theatre located in West Street, near Cambridge Circus on the Charing Cross Road in the City of Westminster. It is one of the smallest of the West End theatres, seating a maximum of 195 people in the Dress Circle and 251 in the Stalls. On Wednesday, 4 April 2007, it was announced that ATG had sold the venue to Sir Stephen Waley-Cohen, who renamed the venue The Ambassadors as it once was, and began an extensive programme of refurbishments. In 2014, Waley-Cohen announced plans to sell the Ambassadors to Delfont Mackintosh Theatres, who have said they intend to rename the theatre after Stephen Sondheim once the sale is completed. The theatre's most famous production is Agatha Christie's The Mousetrap, which showed from 1952 to 1974 before moving next door to the St Martin's Theatre where it is still running. Recent productions have included the multi-award winning production of John Doyle's Sweeney Todd which subsequently transferred to Broadway, Ying Tong – A Walk with the Goons, Someone Who'll Watch Over Me, Journey's End and the world première of Kate Betts' On the Third Day which won the Channel 4 television series The Play's the Thing. In 2006, the theatre played host to the landmark revival of Peter Hall's production of Waiting for Godot which ran for a strictly limited autumn season. 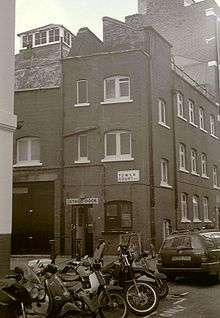 The theatre is currently home to the continuing London run of Stomp having transferred from the Vaudeville Theatre on 27 September 2007, following the successful Menier Chocolate Factory production of Little Shop of Horrors. Other recent productions have included runs of the Bush Theatre's production of Whipping it Up, starring Richard Wilson and Robert Bathurst, and Love Song, starring Cillian Murphy and Neve Campbell (November 2006 to February 2007).